Carlton Schroeder sent this photo. This is my brother Don's L shortly after it was rescued from the WI Northwoods in Fall 2008. 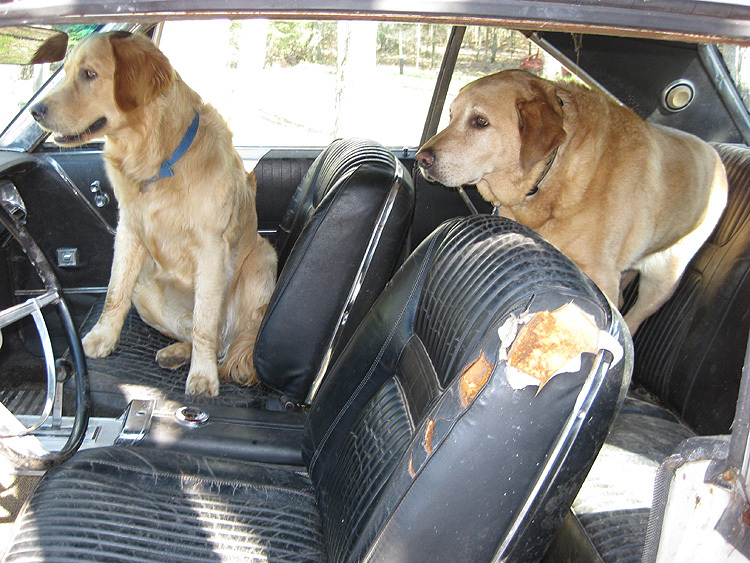 The passengers are Sailor (front) and Bud (back). Don has done a great restoration job and now has all the body work and painting done. He will be installing the rebuilt engine and trans this Spring. He is still looking for some used black leather seat covers. "Aw, Cripes! It was just a little joy ride, and now lookit - they're handcuffing Don. Sailor: I donno. Wait! I see him down the road talking to someone. Bud: That's Uncle Carlton, you nimcompoop! Sailor: Nimcompoop? You're the one who ate the seat! Bud: They're running away. What'll we do? Sailor: Get out and push. We can catch up to them in this nifty 300! Bud: OK. But how do I get back in the car when its rolling?